Age-Proof Your Hair - Anti-Age Naturally! Since last week’s article I’ve received a lot emails with many questions. So I thought I’d better write about this topic again while it was all fresh in my mind. Just like everything else, hair ages. But there are lots of things you can do to have youthful-looking hair. And if you missed last week’s article you can catch up here – Your Crowning Glory – Is It Outing Your Age? From K: What was the cream product you found that worked for your hair? I’ve got big-time frizz and lack shine. Me: The product I use is called Fat Hair – it comes in a red bottle. I think I purchased it from Walgreens or CVS. A little goes a long way with these products. Having said all that, everyone is different and my hair is very fine. Living in Florida, too, the humidity sometimes causes so much frizz. It’ll be trial and error but keep trying, you’ll find the perfect product for you. From M: I color my hair and I know it’s the chemicals that are damaging but I’m not ready to go gray. Do you have any tips that would help? Me: You can try natural hair dyes that are less damaging because they don’t contain peroxide or ammonia. But if you are more than 50% gray you will need to go the harsher route. If you need to use hair color with chemicals, put your color on at the root and leave on for the allotted time. When it’s time to put it on the rest of the hair, take the remaining dye and mix in 2-3 ounces of water before applying. This will prevent the ends from becoming over-processed and damaged. After doing this a few times, you will see a difference. From D: You mentioned supplements for hair fall but do you know a good product that will work topically? Me: Tea tree and rosemary oil’s added to your shampoo can combat hair fall topically. A product I like for hair fall is Infuse. Dr. Sears recommends it to his patients who have hair fall due to hormone issues, but it’s good for any type of hair fall (stress, age, etc.). 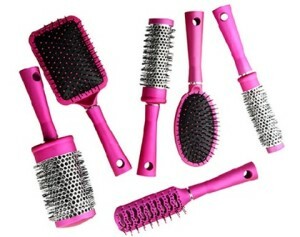 Lastly, if you are like me, you have had your hairbrush way too long. It’s almost like it has become your best friend. You may even panic when you can’t find it. Well, finally I said goodbye to my old friend and was glad I did. The newer brushes, I hate to admit, are better. My new friend has boar bristles and ionic nylon. Dare I say it again – here’s to better days a-head. For a younger more healthier you!